Theatre-types will be interested to know that Totem comes to Auckland via collaboration between Quebec’s Cirque Du Soleil (now celebrating their 30th year) and Quebec’s writer-director Robert Lepage. Theatre visionary Lepage, whose work Needles and Opium and The Andersen Project have toured to the Wellington and Auckland Festivals respectively, is known for fusion of technology and performance and transformative visual spectacle. Totem makes for a rich creative collision. Breath-taking awe begins early: a sparkling silver spinner drops from the heavens above and a giant turtle shell is uncovered to reveal a skeletal frame housing creatures from a primordial stew. The creatures bounce and spin so quickly that their abilities do indeed appear non-human, their tongues flicking out to signal applause. This is a changing circus environment full of surprises, as incredible graphics, machinery, and good old stage tricks change the setting – from the beach to the moon – to suit the act. 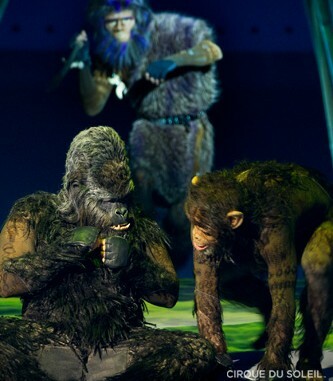 It’s certainly one of the most visually impressive shows I can claim to have seen, and that’s before even the performers, exquisitely costumed, are taken into account. The conceit of Totem is “the birth and evolution of humankind”. While it makes some sort of coherent sense retrospectively in the captions provided in the program, in the midst of the show the narrative comes as a confusing mix of tropes: the noble indigenous people at one with nature, buff Hasselhoffs showing off at the beach, and a simplified version of man’s evolution from crouching ape to bipedal businessman. The evolution jumps back and forth without logical sense; the beach muscle-men appear well before the Neanderthals (maybe this makes sense after all). What it all amounts to is a magnificent playbox to hold the incredible feats of the performers. 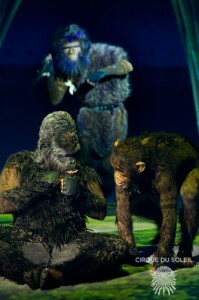 Totem is able to balance the epic and intimate and it’s ultimately the acts, rightfully, that overshadow the scenery. Those Hasselhoffs show off their strength on rings high above us, shooting up our blood pressure as they swing over the audience without any safety ropes. Most acts, feats of strength, endurance and skill don’t need many extras at all. Diamond encrusted Vegas girls spin sheets of material. A duo on roller-skates spin with mesmerising momentum. One of the most thrilling act involved five women, five ridiculously long unicycles, and countless bowls; a precarious balancing act requiring immense discipline and practise. The clowns are often delightfully subversive in Cirque du Soleil shows, and Totem is no exception. While Jon Monestero (for reasons beyond my deduction) is an amusing Italian caricature, Mikhail Usov’s sad fisherman fitted more snuggly in this world, his boating trips gone wrong revealing absurd existential angst. Lepage lends a keen sense of how to build the set pieces. My favourite in this show is the use of a Darwin-scientist figure who cameos in the first half taking notes on monkeys and other wild-life. 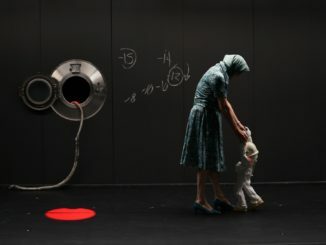 His feature moments comes in Act Two in a laboratory where test tubes become musical instruments, creating an atmosphere of wonder which builds towards his entry into a giant beaker where he keeps numerous spinning, glowing ball-atoms in motion until he makes a chemical reaction of his own. The meta-narrative is one of progression and the universality of human-kind, a celebration which fetishes the natural world and indigenous culture. Totem’s island was never colonised, it would seem. As much as it wants to try to convince us it’s going for something quite profound, let’s not be fooled, it’s a sparkly myth to match a sparkly show, with little room for the contemplation of anything much deeper. With trademark Cirque finish and a pulsating live soundtrack, the international performers truly impress; they’re a strong argument for natural selection. 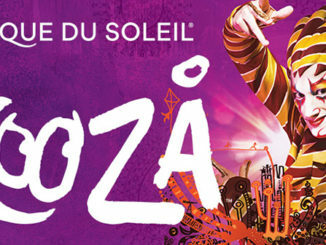 Totem is presented by Cirque Du Soleil and plays at the Grand Chapiteau at Alexandra Park until 28 September. Details see Cirque Du Soleil.